Just a few weeks ago, Google made quite a bit of noise about how their new initiative Google Play Protect; they were working on ensuring that malware apps don't make their their way to user's phones. While that seems like it's a good thing, it's done nothing to keep the bad apps out of the Play Store. 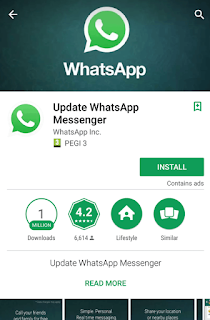 And a big indictment of Google's failure came in the form of a fake WhatsApp app that managed to amass over a million downloads before it was taken down. The fake WhatsApp app named "Update WhatsApp Messenger" managed to fool people into downloading it by using the same developer name and screenshots as the original app. This epic fail is only the tip of the iceberg that's Google's poor app review process which has seen shady anti-virus and cleaner apps become a mainstay in the Play Store.